Well, it may finally have happened, what we’ve all, or most of us, have wanted to have happen. A private contractor wants to build a major residential project in the heart of the South End, something other than a City financed low-income housing project. And it looks like the proposed development along with the developer is something that most people living nearby would really like to see happen. 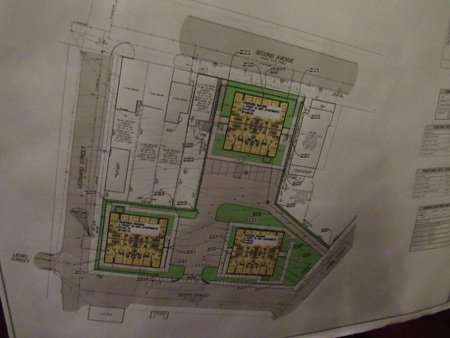 There have been a whole bunch of residential development proposals in the City of Albany since Kathy Sheehan became mayor in January 2013, most of them large multistory complexes rather than smaller one to four unit homes. The reason apparently has to do with money, such projects are more profitable to the developers while smaller ones at best barely break even, or so they say. The residents of some neighborhoods are fine with big projects, but others, particularly uptown where single family houses predominate, often angrily object to these big projects appearing near their homes. But the South End is the one part of the City that hasn’t seen any of these proposals. There are a variety of reasons for that, most of which could be summed up as economic malaise and abandonment caused by many decades of government sponsored anti-urban policies designed to destroy the South End. Starting with the end of the last City administration those policies have not exactly been radically reversed, at least not yet, but the City has made some effort to lay the groundwork for attracting developers and businesses. But up until now it hasn’t been enough. 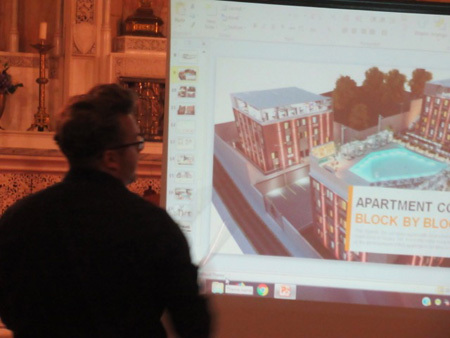 The developer proposing this project is Corey Jones, who has put together a company called South End Development to build and to maintain the buildings after they are built. 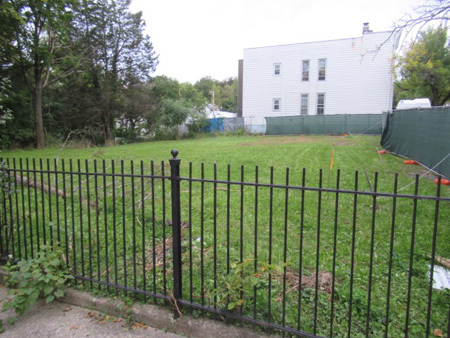 His proposal, which he said he’s been putting together for the last three years, is to build three residential towers of four stories each on a mostly empty lot at 76 Second Avenue. (The project is called The Seventy Six.) Each tower is to have 16 living units ranging from studios to 3 bedroom apartments, an ambitious undertaking to be sure. Now, the initial publicity for this proposal did not look good, to me and to others it sounded like some hit and run outside developer was trying to gentrify the neighborhood and push lower income people out. 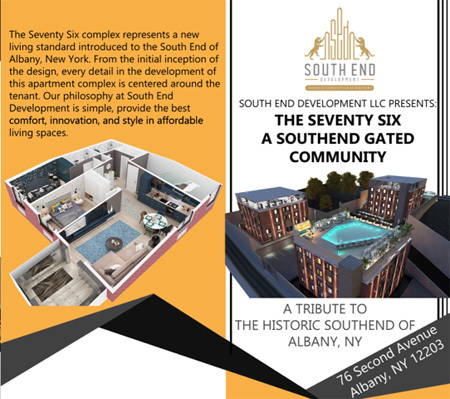 The flyer being sent around, for example, called the project “A Southend [sic] Gated Community” and emphasized such things as security cameras, a wall around the buildings and armed guards. The first impression was very much the kind of things you’d expect from a gentrifying developer running over the neighborhood to make a fast buck. But Mr. Jones did his best to let us know that he was not some interloper out to take advantage of the community. For one thing, he was born and raised in the South End, he is anything but an outsider to many of the neighbors. He had spent the last ten years managing “large federal projects” and feels that he is ready and has the expertise to bring his skills back to help the old neighborhood with his own first major project as a general contractor. “I want you to know,” he told us at a public meeting, “I’m here to stay. My intention is to rebuild the South End. I love the neighborhood. My sole purpose in life is to bring the South End up one block at a time.” Perhaps this was hyperbole but his sincerity as he said these things sounded very genuine. Most importantly, he also said, “I want to give people and businesses a reason to move into the South End, I don’t want to kick people out.” This of course has been the ideal behind the City’s halting and scattered construction initiatives in the South End over the past decade, to “jumpstart” economic development by attracting private developers and businesses and thus creating jobs that will attract population. As every observer has been forced to sadly admit, so far this has not happened to any significant degree. 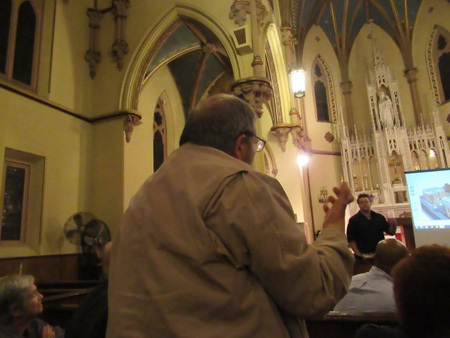 The well attended public meeting where Mr. Jones explained all this happened one evening in late September at Elijah Missionary Baptist Church at 74 Second Avenue, a beautiful old former Catholic church built in 1880 which is next door to the proposed project. I have to say that what I saw and heard assuaged a lot of my fears, especially noting how most of the immediate neighbors were actually enthusiastic about the proposal, seeing it as a much need and anticipated improvement. I will say I have some questions and concerns about some of the details and about the scale of the proposal, but it looks like it could be exactly the kind of thing most people are hoping for. The fascinating thing that I observed is something that I’ve seen before in public meetings about development proposals in the South End, there was a clear demarcation between the white people and the black people. Most of the black folks were enthusiastic about the project, seeing it as exactly the kind of positive change the neighborhood needed. 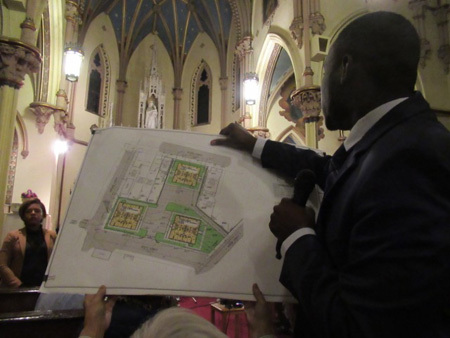 But most of the white folks were opposed, they did not want these towers built in a neighborhood of mostly two and three family homes, they did not want to see this sort of change. In other words, the white people didn’t want to see the character of the neighborhood changed, which I guess they feel attached to. But the black people very much wanted to change the character of the neighborhood, which they clearly feel is stuck in decline. Isn’t that interesting. There were exceptions, but that’s pretty much how it lined up. By the end of the meeting I was persuaded to have a positive view of the proposal for several reasons, one being that those who live and own property closest to the proposal want to see it happen and want Mr. Jones, whom they considered one of their own, to succeed. As someone pointed out, having a developer who hails from the neighborhood is much preferable to having some big corporation exploit the area and run over the neighbors. I’d never even heard of Mr. Jones before that evening so I can’t make any informed judgements on his integrity, but that the people who saw him grow up are willing to trust his promises and his vision are strong indicators that I have to respect. 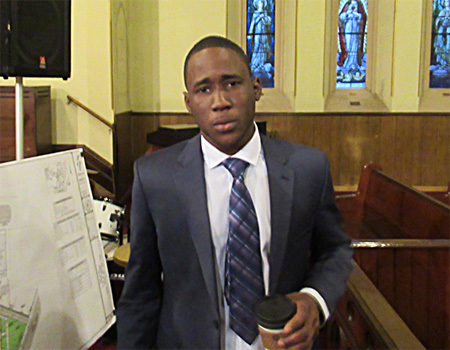 An interesting point was brought up by several people including by Jahkeen Hoke, who grew up nearby on Second Avenue. Today Mr. Hoke is very much the consummate professional, his impressive resume includes working for the City of Albany, for the Albany Industrial Development Agency, and as a co-founder and Chief Development Officer of a non-profit that works with at-risk youth called 4th Family, along with being a co-founder of the Black Chamber of Commerce. He always introduces me to other people as the guy who gave him his first job at age 12 wrangling the trash on Sunday nights at my properties, now he drives a fancy car and wears suits. 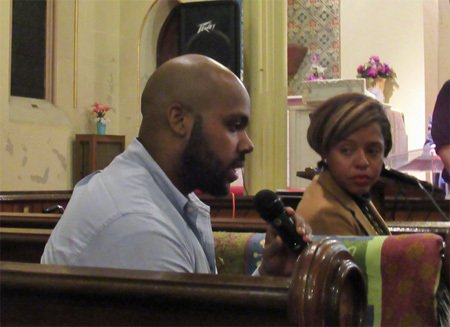 Mr. Hoke explained (I’m paraphrasing) that one of the running problems for young South End residents who have moved up the ladder like he has is that there is little incentive for them to stay in the South End and contribute to the community. While there are plenty of (in my opinion) wonderful houses nearby that date back as far as the early 1800s, very few of these old buildings have been modernized and thus made attractive to those who are looking for something more upscale. Thus because of the lack of attractive housing there is guaranteed to be a continuing brain drain out of the South End, very similar to the often noted problem of South End residents acquiring skills in various trades through City sponsored programs and immediately taking those skills elsewhere. Thus the problem of the South End continuing to be a not economically viable place comes down, according to Mr. Hoke and others, to housing, the solution being to provide a variety of housing that residents who acquire trades or succeed in management want for their homes. One of the ideals among urban planners is the idea of mixed income communities as the desirable alternative to ghettoizing economic classes into rich ghettos, middle class ghettos, working class and poor ghettos. And of course no one with any sense wants to continue to promote ghettos delineated by ethnicity or skin shade. An objection to the apparently severe security for the building was raised by former Common Council member Dominick Calsolaro, who lives on a side street off Second Avenue a little ways up the hill, saying he was “personally insulted” by the implication that the neighborhood was that unsafe. In reply one nearby resident (whose name I didn’t catch) stated that she and every person who lives in the immediate neighborhood had had incidents happen to them or to their homes, and thus appreciate the high level of security. This was met by strong applause, mostly by the black people at the meeting who lived nearby. But I do agree that the surrounding wall, which will separate the buildings from the neighborhood, may prove to be counter productive. Another point raised by Mr. Calsolaro was that the neighborhood is zoned for one to three family structures, there would have to be a zoning change approved by the Common Council. Again, it was the black folks living nearby who had no problem with the size and height of the proposed buildings, but in particular one white couple in attendance, long time owners and occupants of a nearby historic building on Second Avenue, were deeply concerned about crowding out smaller buildings and people looking down into their back yard. 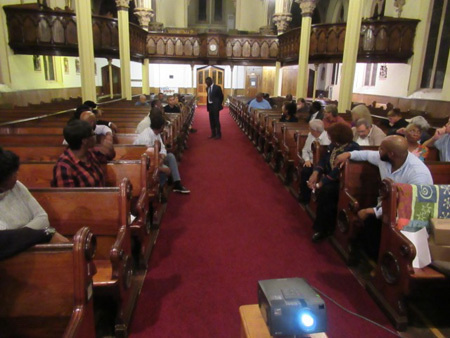 But for the majority in attendance, “changing the character of the neighborhood” was not seen as a threat but as something to be desired, as the neighborhood has been in such dire condition for so long. So yes, the apartments in this proposal are upscale. They range from studios starting at $700 per month to 3 bedroom suites going for $2500, presumably on the top floor. The rents include all utilities including wifi and parking and other amenities available to tenants. 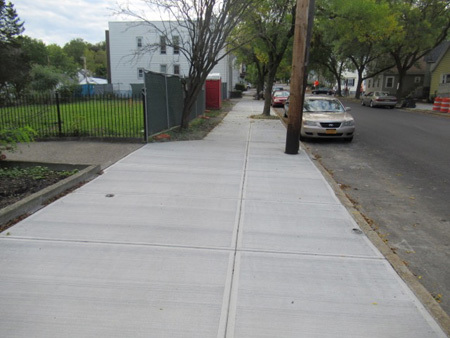 However, one of the problems is that there does not seem to be enough parking spaces on the property to go around and some cars will have to go on the street, hopefully some parking for tenant’s cars can be found nearby so that parking can always be included as part of the rent as promised. A certain number of apartments are reserved for low income tenants, Mr. Jones did not go into this but that is often a requirement of certain revenue sources and tax abatement programs. There will be no ground level retail spaces, but Mr. Jones has an ambitious idea of putting a swimming pool and other amenities on the roof of the first building that he plans to construct, the idea being to both make this available to tenants and to rent out to receptions and such. I suspect this will eventually prove untenable and be quietly jettisoned from the plan, but it certainly would be something if it got added. Each apartment includes a washer and dryer, and if I understand correctly each unit unit has it’s own heater and comes with air conditioning. This seems rather odd to me, wouldn’t it be more energy efficient to have a central heating unit and zone valves so each tenant can control the temperature. For some reason it was never made clear that there would be central air conditioning, but that too would be the best way to go. Several people asked about solar panels and to my surprise Mr. Jones dismissed the idea. A set of panels on the roofs of the buildings grid-tied would significantly reduce electric costs for the owner. I strongly suspect that Mr. Jones does not want to add a solar system because he is much enamored of the idea of a swimming pool on the roof of the first building, and may have similar plans for the other buildings. As for cost, I asked Mr. Jones after the meeting about what kind of money he needs to get the first building constructed, and his answer was that the figure was not determined yet but would fall between $1.9 and $2.5 million. Right now he has acquired “about 50% to 60% of the land and is in negotiation for the rest,” confident that will be done. This figure will also include initial preparations for the entire site, so presumably the cost of constructing the next two buildings will be less. The biggest site preparation issue is water runoff. I talked about this after the meeting with Nick Daniels of the almost politically required in the City of Albany engineering firm of Hershberg and Hershberg (which shows some good common sense by Mr. Jones that he retained them, one less obstacle.) The runoff issues have been identified but the solutions have not yet been worked out with the City. Since this is a densely populated area it is essential that water from storms that falls on the site be channelled away from the street and away from nearby structures. However, down here in the South End we have the notorious Combined Sewer Overflow (CSO), which means that the storm drains and the sewers are connected at various points so that the two systems can collect overflow from each other. This was considered a good idea over a hundred years ago when the drainage systems were laid under the streets, this was also back when no one cared about the environment and all the dirty water just poured into the Hudson River. So part of the site preparation involves installing catch basins under the ground. The idea is that if there is a “100 year storm,” which due to Global Warming seems to be happening every few years, water that falls on the site will flow into the basins first and only slowly flow into the storm drains, that way the drainage system in the vicinity won’t be overwhelmed. The size and configuration of these basins have yet to be determined, this could contribute significantly to the overall startup costs. The political landscape so far looks favorable. The site of the project, to my surprise, falls into the First Ward. Past decades of gerrymandering has cut up Second Avenue into a patchwork shared by the First and Second Wards. This has traditionally been done by our civic leaders to intentionally divide neighborhoods so the citizens have less political pull that could threaten the power of elected officials, but never mind. First Ward representative Dorcey Applyrs seems well disposed to the project, which is important if Mr. Jones wants a zoning change approved by the Common Council. Ms. Applyrs, as is customary for her, stepped up about two thirds of the way through the meeting to take charge and make sure the meeting wrapped up on time and in an organized manner. Also present was Second Ward Common Council member Derek Johnson who made sure to voice his approval of the project. 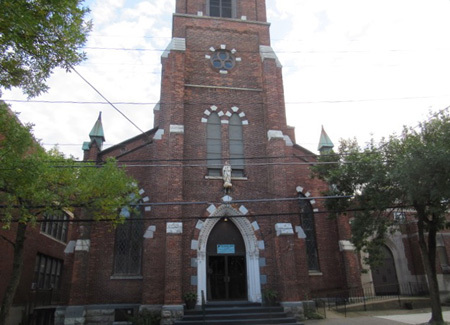 In addition such luminaries as Anne Pope, Carolyn McLaughlin and Pastor Avery Comithier who presides over this church gave their strong support. The support of the neighbors is likely to be decisive. The big danger for Mr. Jones is if one or more of the neighbors decide to file a lawsuit, which could cause delays and expenses that could easily finish off his plans. I would strongly suggest to him that he identify those individuals who are opposed to the project or uneasy with it and very seriously work with them to deal with their concerns so as to head off this possibility. So we shall see how this goes. It’s terribly ambitious, and it’s a radical architectural departure for the immediate neighborhood, but these towers would certainly not be the only tall buildings in the South End. The exterior is either brick or brick facade (that was not made clear) but I would like to see a better depiction of how these buildings will look from the street, will they be ugly or pleasing to the eye. That’s important, ugly buildings can bring down a neighborhood much like abandoned buildings do. We might very well see some modifications to the plan at the instigation of the City or because circumstances dictate, perhaps some scaling down or exterior changes to fit in better with the nearby architecture. These buildings will be with us until after all of us who attended this public meeting are long gone, so we need to see this done properly all around. So far, or so it seems to me, we have a proposal that is worth considering that may be exactly what we have been looking for.